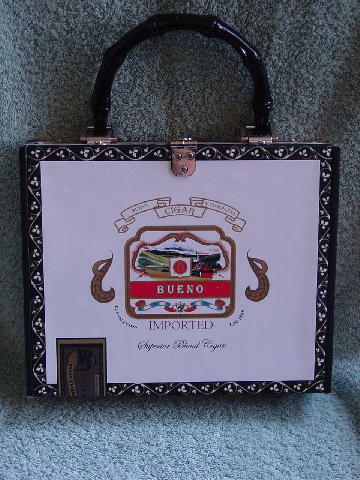 This cigar box says Bueno Imported Superior Blend Cigars. Establecida En 1865. Suave Y Compania Cigar in golden-honey, green, black, red, and blue on a white background. It's bordered by a white flower vine on a black background. 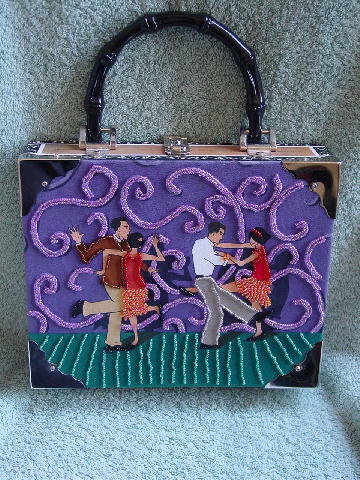 The other side has a purple and dark teal fabric background with Charleston dancers in brown, tan, red, orange, beige, black, and white. There are tiny iridescent beads in teal, orange, red, black, copper, and lilac. The front side has silver-tone metal corners. The black 11 1/4" long handle is a faux bamboo (probably plastic). The latch, loop, and handle attachments are in silver-tone. 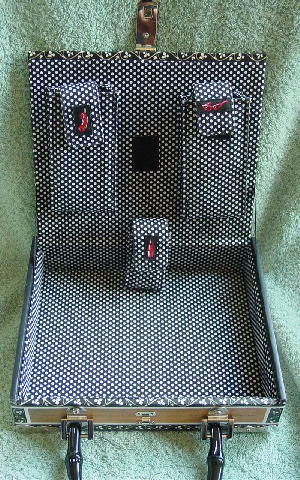 The interior (bottom and sides) is padded and has a black fabric background with white dots. 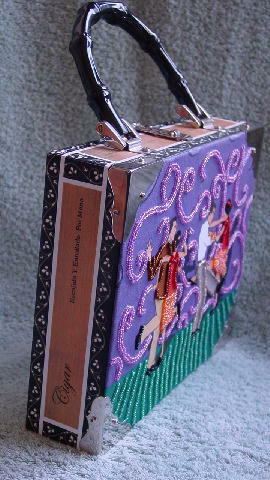 The interior lid has velcroed detachable fabric cases for your cell phone, lipstick, and sunglasses. All three have velcro lid tabs. It's definitely a conversation piece.